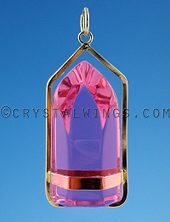 Why Wear Crystal Wing's Pendants? 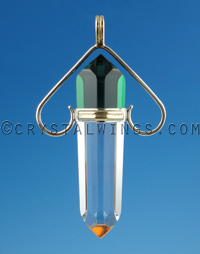 These powerful pendants can travel with you no matter where you go, or what you experience. Carry "Become a bright light by taking care of your own energy field." 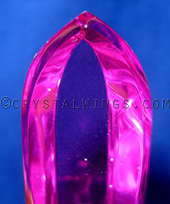 along the energy of protection with the Vogel Star of David's, the undaunted unconditional love with the Ruby Lavender Quartz pendants, or heightened spiritual connection with the many other powerful pendants. These have been invaluable for those individuals who would like to not only be 'healers' by working with wands but by merging their presence with the integrity of these tools. Become a bright light by taking care of your own energy field. 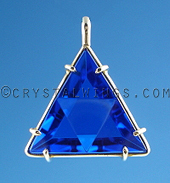 These are provided for those resonating with sacred geometry tools, Marcel Vogel's teachings, and the power of the crystalline in one's life. Every pendant that we have in stock has been hand selected by Bill based upon quality of energy, quality of the physical stone, craftsmanship, and the source of its shape.